January 27, 2016 By Bob Pilgrim & filed under All Articles, Handguns, Weapons. Glock 43 and second six-round magazine, magazine loader, and cleaning gear. FBI Firearms Training Unit Challenge Coin (not included) embellishes kit. Nowhere else has the public’s desire for a highly concealable handgun in a serious caliber been more evident than with the long-awaited 9x19mm Glock 43 (G43) pistol. Even though the Glock 42 filled a gaping hole in the Glock concealed carry inventory, many serious gunners told me they would have preferred it in Parabellum, not in .380 ACP, and waited. Oddly, Glock released it to the general public before letting the horde of gun scribes get their hands on one. With sales already at stratospheric levels, writers will have little influence on sales volume. Currently manufactured in Austria, the G43 is as much a Glock as the new Glock 40 in 10mm, but in a class of its own. Both it and the G42 are in Glock’s new “Slimline” class, and the absence of front-strap finger grooves and interchangeable back straps confirm that it is not wholly a Generation Four gun. Take it apart and everything looks familiar, only a tad bit smaller than most of the company’s line-up. Field stripping and operating procedures are the same for the entire line, which makes the smaller Glocks excellent BUGs (Backup Guns) and logical off-duty firearms. In fact, the manual supplied with the little gun is not model specific. G43 overall size compared to Bersa BP9CC 9mm single-stack pistol. It arrived in the usual Glock padded polymer lockable case. Accompanying the pistol are two six-round drop-free single-stack magazines (one with a comfortable pinky rest), magazine loading device, cleaning brush, security padlock, manual, spent sample cartridge case, and accompanying papers. Late to the sub-compact gun market, the G43 is not the smallest Parabellum available, but its 0.87-inch Tenifer and Parkerized slide width is notable. The usual white highlighted ball and rear polymer fixed sights interrupt the flat steel slide’s surface. They are not rakish looking, but totally practical, as is the entire pistol. Never designed to win beauty contests, the Glock’s plain looks are inconsequential due to the brand’s extreme reliability. Aft gripping serrations are wide and deep, giving the shooter plenty of purchase when cycling its slide even if wet. Forward serrations are not needed because the gun presents a no-slip surface that is rust resistant. These features have endeared Glocks to Israeli martial artists, as they facilitate their preferred empty-chamber method of carry. An external extractor also functions as a loaded chamber indicator that can be viewed and felt. Internal fit and finish are smooth and bereft of tool marks. Its linkless hammer-forged 3.39-inch Hexagonal rifled barrel has a 1:9.84 twist and locks up at the breech. It is rated for +P ammunition. Fieldstripped G43 showing barrel’s dorsal camming surface and linkless profile. Lock-up is very tight and consistent. Dual recoil springs help attenuate recoil and improve positive feeding. Pistol was 100% reliable. The dual spring wrapped guide rod provides stored kinetic energy for functioning. The tandem springs are critical to the pistol’s reliability but also absorb recoil, increasing comfort and control of the light piece when fired. G43 and older G26 sibling. G43 has beavertail but no front-strap finger grooves. G26’s beefiness relative to single-stack 9mm is apparent. My sample pistol’s grip surface stippling and checkering appeared to be a little too light and shallow to foster control. I would prefer it to be more prominent. A beavertail and undercut trigger guard permit a higher grip and avoid slide bite. A large no-miss magazine release is reversible but not vulnerable to inadvertent magazine release. Magazines readily clear the well, which is modestly beveled to facilitate speedy reloads. With only six plus one stored kills, reloading skills may be critical. The trigger guard is large and accommodates driving gloves. One of the first things custom Glockmeisters do is get rid of the trigger guard hook and round it. I think it is good for striking but questionable as a shooting aid. Glock should survey its fans and ask them if this design should be continued. Upper frame finger grooves are fine, but they are so shallow that they are insignificant. The gun’s serial number is embedded into the frame’s underside in the normal manner, and major parts are also serialized. Like all Glocks, the G43 has three safeties. The point-and-shoot piece features its famous trigger safety, which has been copied by many other manufacturers, a firing pin, and drop safeties. 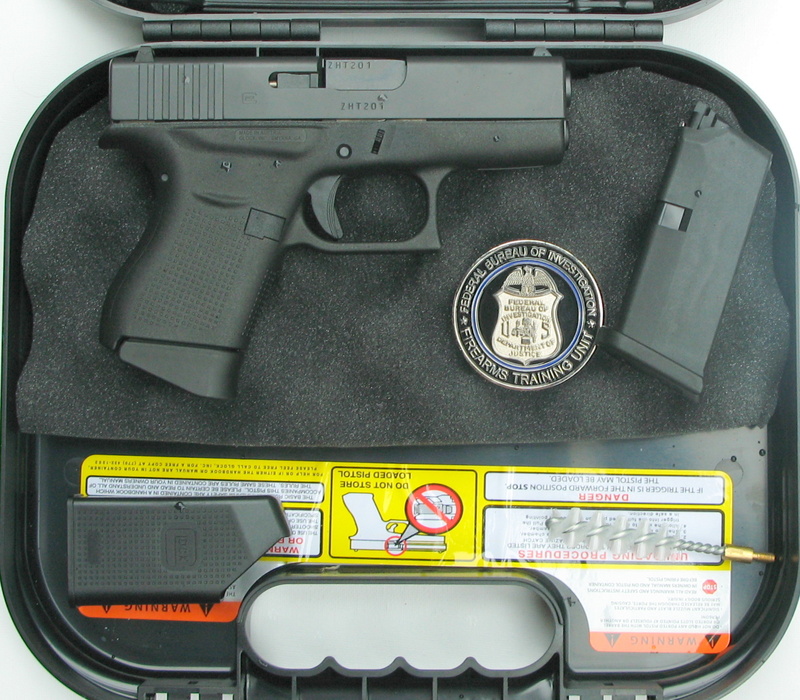 Fully loaded with seven rounds of Federal 124-grain Hydra-Shok ammunition, the G43 weighs 21 ounces. 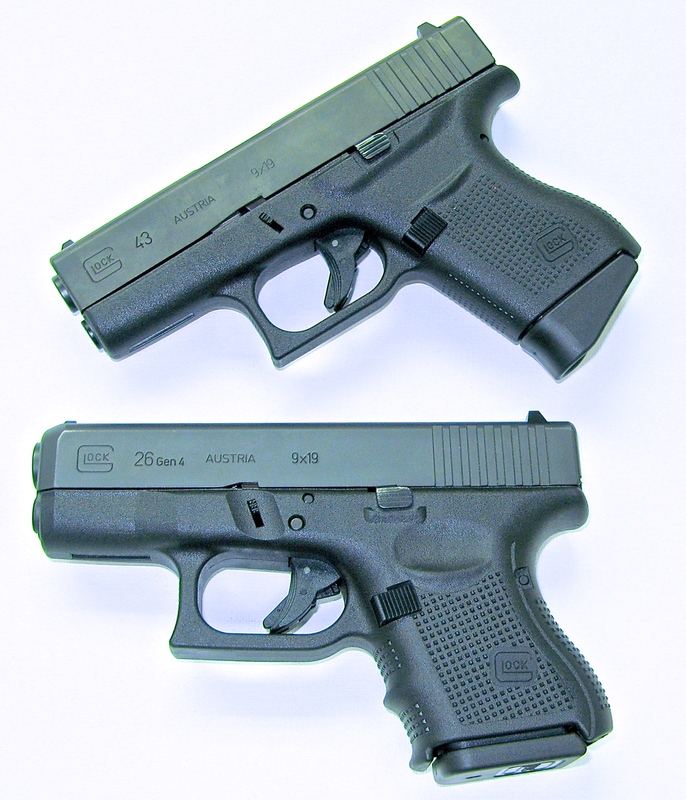 In a similar degree of readiness, the G42 is more than six ounces lighter than its bigger sibling. If concealment is paramount, these size and weight differences might cause you to reconsider the smaller gun. I mention this because retired police Sergeant Doug Belcher, a bruiser of a man, wanted a pocket pistol and determined that the G43 was not a good fit for a front-pocket carry option and instead has defaulted to the G42. That and his belief that 9mm Kurz has also benefited from the current 9mm ballistic improvements give him confidence in the smaller caliber. But his preference does not mean the G43 cannot slip into one’s pockets and be subtly and readily available in an appropriate scabbard. 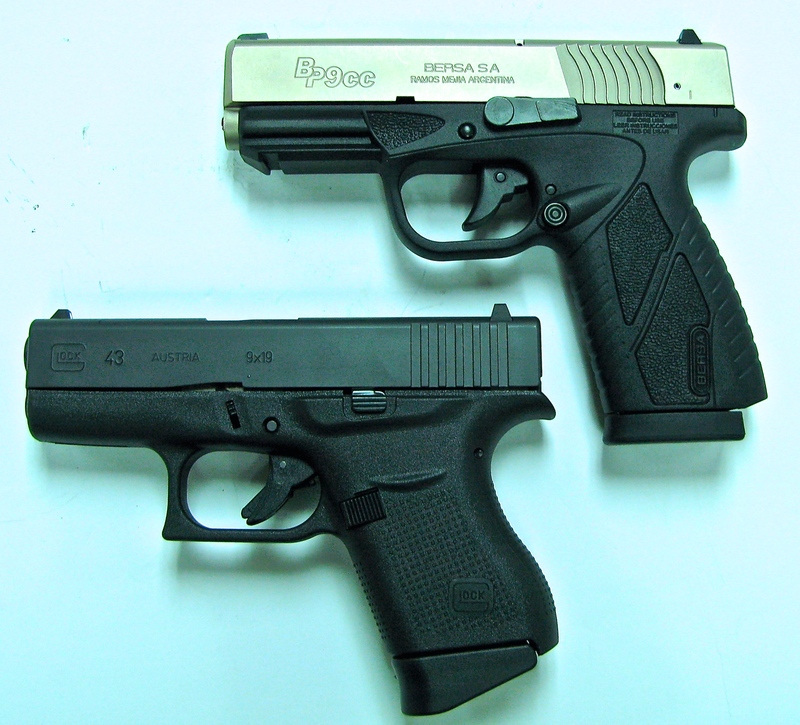 The G42 and G43 are not the smallest sub-compacts on the market, but Glock’s balance of size and weight makes both guns very controllable to discharge. G43 charged with controversial RIP round. Checkering and stippling on grip was almost nonexistent, but gun remained controllable. My sample’s 6.5- to 7.0-pound Safe Action® trigger pull is well over its advertised 5.5-pound weight and requires real deliberation to operate, so it acts as a kind of safety. But its weight is within Glock’s acceptable range of resistance. It demonstrates a modicum of 0.837-inch take up, hits the sear wall, and breaks suddenly and crisply without overtravel. Reset is short and positive. To better control heavy triggers, I recommend that shooters employ the first joint of the index finger and that it be hooked around the pistol’s Safe Action trigger. This normally occurs anyway as soon as the first shot is fired. Recoil and gun movement will cause the finger to drift deeper into the trigger, so put it there at the outset. The most important consideration is to learn to pull the trigger straight to the rear and adjust trigger finger placement until it facilitates this action. If you shoot the larger Glocks, you’ll be right at home with this single stack. Amazingly, G43 trigger reach is dimensionally equivalent to its bigger brethren. 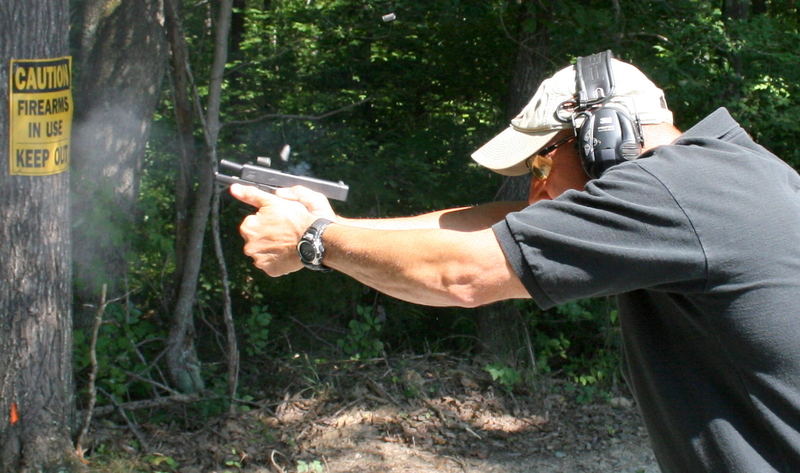 The average Glock shooter will often print low and to the right or left of the target when speed shooting. Pivoting trigger guns lend themselves to this error and it is compounded by smaller guns with reduced sight radius and heavy triggers. Furthermore, it is difficult to isolate all fingers from each other and, almost imperceptibly, the whole hand and fingers contract when the trigger is pulled. This action will also “milk” shots to the left or right of the intended impact area. During practice, focus on the front sight and prevent it from wandering laterally by compressing the trigger straight to the rear. Former U.S. Air Marshal Ken Trice gets off fast triple tap with G43. Recoil is harsh but not painful. Except for these dynamics, the pistol is boring to shoot. Ten different rounds were used to determine the G43’s potential accuracy, velocity levels, and reliability. Pocket-sized ordnance is designed to be used in close, where most handgun fights occur. Former Supervisory Federal Air Marshal Ken Trice attacked a series of bull’s eyes from a handheld rest at ten yards. The first “cold bore” shot was dead center, so we continued using a center hold. Because of the trigger’s degree of resistance, Ken used a deep trigger finger hold. Recoil is definitely noticeable but far from uncomfortable, and no one who shot the pistol had to regrip it post recoil. Commercial airline Captain Tom Carty and his engineering student son, both occasional marksmen, had no difficulties with the gun, and reliability was 100%. Frankly, other than the healthy recoil, the G43 is boring to shoot. Best group and best “feeling” round was a surprise. Trice liked Federal’s +P+ 115-grain jacketed hollow point (JHP), which printed a 0.662-inch cluster. 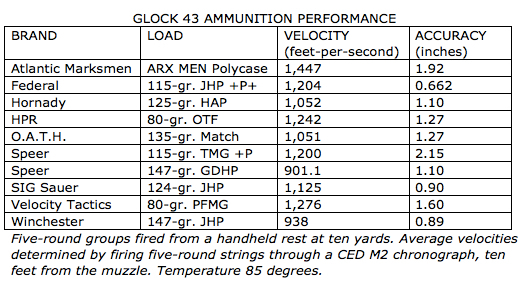 High average velocity of 1,447 feet-per-second (fps) was achieved by Atlantic Marksmen’s ARX MEN Polycase ammunition. The lightweight sintered projectile resembles a turbine and purportedly churns through tissue like a propeller. 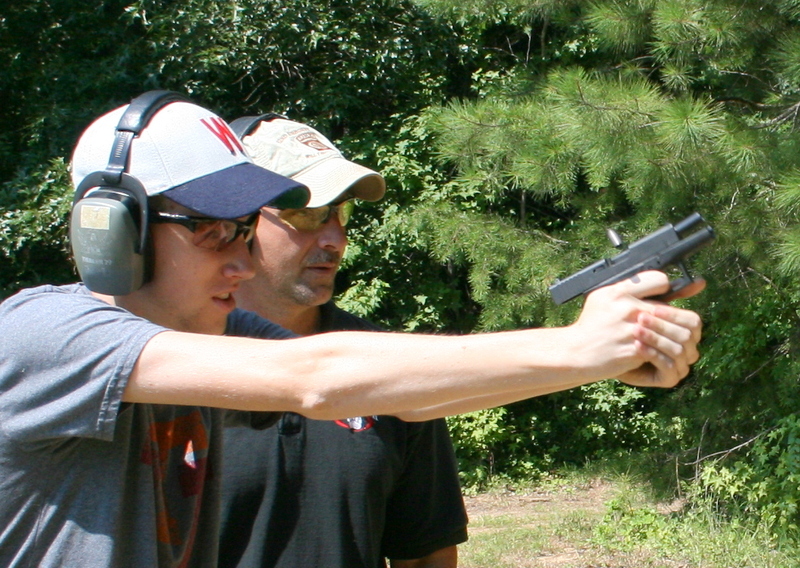 With former U.S. Air Marshal coaching, engineering student familiarizes himself with G43. In spite of stout recoil and relatively heavy trigger, he hit where he looked and did not experience post-recoil regripping. Pistol retains Glock’s good ergonomics. 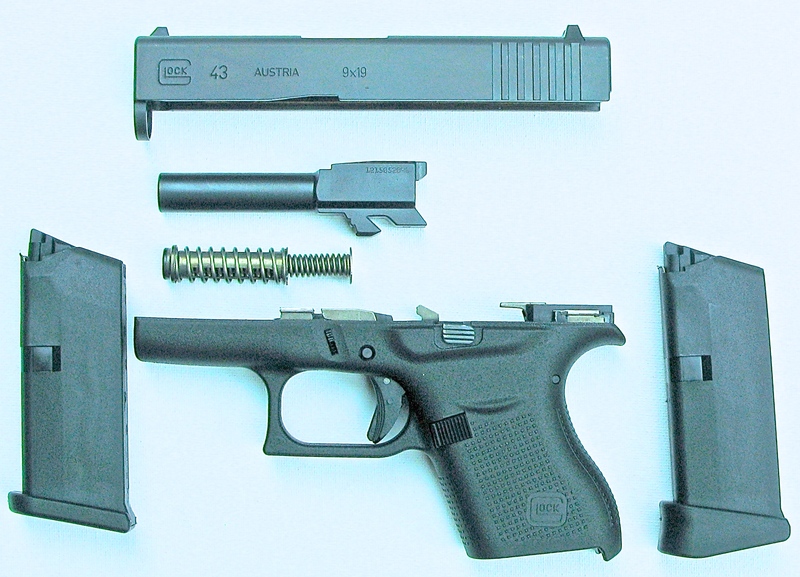 The G43 does everything that bigger 9x19mm Glocks are expected to do, but with a little more drama. Velocities and a degree of accuracy are sacrificed, but the pistol is more than adequate to fulfill its mission of close protection. Compared to its smaller .380-caliber G42 sibling, which is one of the most pleasant pocket guns to shoot in that caliber, recoil is harsh but not painful. 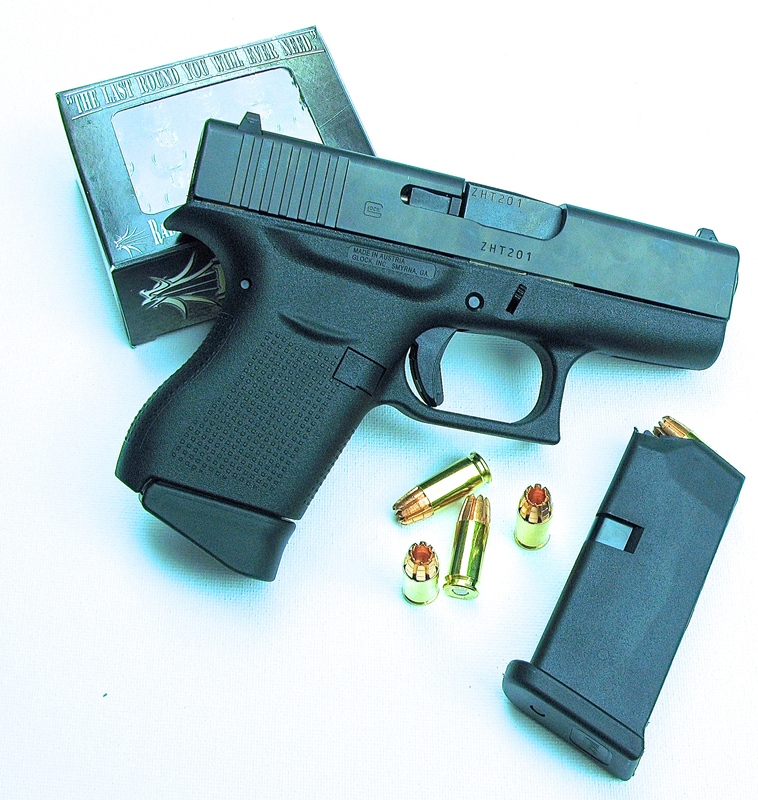 This dynamic may turn off some women or new shooters looking for a small, concealable and powerful handgun that can be carried in some manner almost anywhere. It is accurate for its size, totally reliable, and feels good ergonomically. I wouldn’t recommend it for a first gun, but one that someone could graduate to after sufficient practice and familiarization. On the downside, it carries a relatively steep price point, and a number of equally excellent sub-compacts that cost far fewer coins are on the market. Some may want to use that difference to buy ammo. Bob Pilgrim holds an MS degree, was a Marine Infantry officer during the Vietnam conflict, and retired from the FBI as a special agent, where he was the field SWAT program manager. His Special Operations and Research Unit created and trained the FBI’s Hostage Rescue Team. After retirement, he was an adjunct instructor at the Smith & Wesson and SIG Sauer Academies and a subject-matter expert for the USDOS’s Anti Terrorism Assistance Program.